Being a pharmacy technician is an exciting career with varied opportunities. If you live in the state of Arizona, you will be happy to hear that becoming a pharmacy technician in that state is a streamlined and easy to understand process. Once you have made the decision that this promising career is right for you, you will have a clear path to follow. Before making the decision to train to be a pharmacy technician, you need to know what a pharmacy technician does. Let’s discuss that here. Pharmacy technicians are dynamic professionals who have many different responsibilities. They are vitally important to the running of pharmacies. In fact, it is inconceivable that pharmacies of any size but the very tiniest would be able to exist without them! The pharmacy assistant is an indispensable aid for every pharmacist, and works under his or her supervision. •	Recording patient or customer information in the computer system. This includes prescriptions currently taken by the customer. •	Filling prescriptions for customers and/or patients, in the process collecting the information needed to do so. This involves taking information from customers, patients, and/or health professionals. •	Setting up consultations between pharmacists and customers when customers have questions or concerns. •	Depending on the pharmacy, pharmacy assistants may also be required to operate equipment for automated dispensing. •	Pharmacy technicians who work in medical facilities such as hospitals may be required to work with a wider range of medications, including intravenous medications. •	Pharmacy technicians working in hospitals may be required to do hospital rounds, providing medication to patients. Pharmacy technicians work in several different environments. 52% of pharmacy technicians work in pharmacies and drugstores, while 13% work in general hospitals (both general and surgical). 7% of pharmacy technicians work in general merchandise stores (other than drugstores), while another 7% work in grocery store pharmacies. 4% of pharmacy technicians work in department store pharmacies. Depending on where you work, you might have the opportunity (or face the requirement) of working evening or night hours and/or weekends. You should be aware that pharmacy technicians are typically required to be on their feet, often moving around for the majority of the workday. What Personal Qualities Do You Need to Succeed as a Pharmacy Technician? •	Attention to detail: Pharmacy technicians must have the ability to pay strong and consistent attention to detail. •	Interpersonal skills: Pharmacy technicians need strong interpersonal skills to deal pleasantly and effectively with customers and/or patients, as well as the pharmacist. Interpersonal skills include understanding non-verbal communication as well as verbal communication. •	Communication skills: Pharmacy technicians need to have excellent listening and speaking skills in order to succeed in the workplace. Listening skills are especially important, as failing to listen could lead to a potentially dangerous or even deadly mistake. •	Customer-service skills: Successful pharmacy technicians need strong customer service skills in order to politely and helpfully deal with customers and/or patients. Have you decided you want to become a pharmacy technician in Arizona? If so, you are at the beginning of a very exciting and fulfilling journey! •	You must be a resident of Arizona. •	You must fully inform the board of any misdemeanor or felony charges when applying. •	You must have a high school diploma or an equivalent qualification. •	You must include the full application fee of $46. Pharmacy technician licenses must be renewed every two years. •	You are 18 years old or older. •	You are of good moral character. •	You are legally able to work in the United States. You are either a U.S. citizen or can provide proof of your eligibility to work in the country. •	You submit the application fee of $46 with your application for the license. •	You have PTCB certification, and can provide proof of it in the form of either your Pharmacy Technician Certification Board (PTCB) certificate, PTCB well card, or a letter showing that you had a passing score on the PTCB exam). •	You submit the application fee with your application. The application fee varies by the month in which you submit your application. The general range of the fee is between $52 and $19. In order to renew your license every two years, you will need to carry out 20 (twenty) hours of continuing education. What is the Pharmacy Technician Certification Board (PTCB) Certificate? When you read the above description of the criteria needed to apply for a full pharmacy technician license, you probably noticed mention of the Pharmacy Technician Certification Board (PTCB) certificate. The PTCB certificate is the culmination of the education and training you need in order to become a Pharmacy Technician. In order to earn the PTCB certificate, you must pass the PTCB exam for pharmacy technicians (the Pharmacy Technician Certification Examination). And in order to take and pass this exam, you need to complete an education and training program for pharmacy technicians. Many such education and training programs involve on-the-job practice in real pharmacies that will require you to obtain a pharmacy technician trainee license. You will remember that we discussed how to go about getting such a trainee license earlier in the article. When looking at programs that will help you become a pharmacy technician in Arizona, make sure that whatever ones you consider are properly accredited. A good program will offer you the appropriate coursework and instruction that you will need in order to excel on the Pharmacy Technician Certification Exam. Some programs will also offer you intensive work experience in a real pharmacy workplace environment. When considering pharmacy technician education and training programs, there are a number of considerations you may want to keep in mind. A good program will have instructors who are qualified pharmacists themselves, preferably with a great deal of experience. You might also want to make sure that the program you choose offers experience with technical equipment, as well as pharmacy management software training. Look at your prospective program’s facilities. Are they modern and relevant? The length of the pharmacy technician program varies from school to school. Some programs can be completed in only months rather than years. •	Expanding health insurance numbers: Federal reforms in health insurance will likely continue to ensure that more and more people have health insurance to cover their prescriptions. •	Chronic diseases: The chronic disease rates are continuing to rise. •	More tasks for pharmacists: The fact that pharmacists are taking on more tasks (such as administering flu shots), it is possible that pharmacy technicians will be required to fulfill a greater number of responsibilities, and will become even more essential to a successful pharmacy. •	Improvements in pharmaceutical research: As pharmaceutical research becomes more and more advanced, there will be increasingly greater number of prescription drugs for a greater number of medical problems. The national median annual pay for a pharmacy technician in 2015 was $30,410, while the average hourly pay was $14.62. There were 372,500 new pharmacy technician jobs created in the United States in 2014. The highest average salary for pharmacy technicians tends to be for those working in general medical and surgical hospitals. Pharmacy technicians working in such a setting have an average annual salary of $35,280. Let’s talk about the salary prospects of pharmacy technicians specifically in the state of Arizona. The amount earned by pharmacy technicians tends to vary by area. Like in most professions, pay in large cities may tend to be higher than in small towns or rural areas. In the city of Phoenix, Arizona, the median annual salary for a Pharmacy Technician is $31,402, slightly higher than the national average of $30,410 we discussed earlier. In Phoenix, the general pay range for pharmacy technicians tends to be between $28,319 and $35,034 per year (this figure does not include possible benefits and potential bonuses of any kind). Factors influencing your level of pay will include years of experience, level of education, location, company size, and industry. 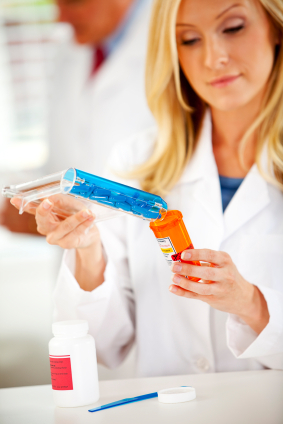 Becoming a Pharmacy Technician in Arizona is a Great Opportunity! There is a lot of wonderful information in this article for you to learn and think over in your process of deciding whether becoming a pharmacy technician is right for you. As we have seen here, the position of pharmacy technician is a strong one in Arizona and in the United States generally. Good job growth is expected for the foreseeable future, and there are many reasons why it is extremely unlikely that this field will shrink within any of our working lifetimes. Engaging in an educational and training program that will prepare you for the Pharmacy Technician Certification Exam is a fun adventure! You will learn a great deal, not only about the field and your function within it but also about yourself and your own capabilities. You will refine your strong attention to detail, as well as your organizational skills, math ability, communication skills, and customer-service skills. Completing an educational program to become a pharmacy technician will allow you to make use of your talents and skills.